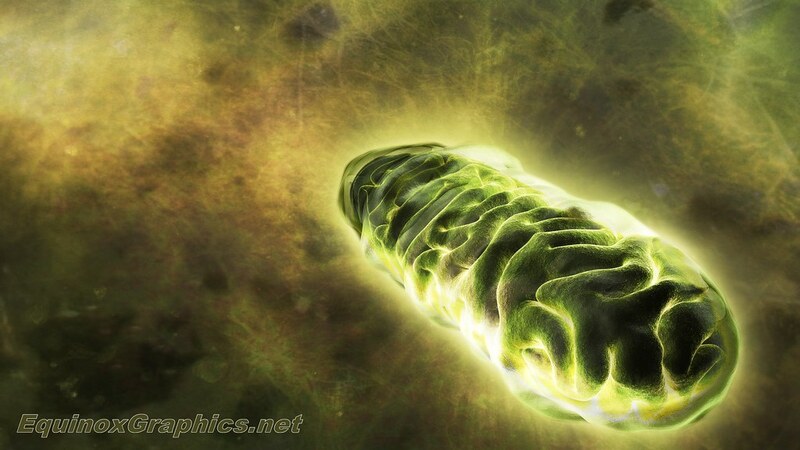 Description: Illustration of a mitochondrion (plural mitochondria), which is a membrane-enclosed organelle found in most eukaryotic cells. Mitochondria are sometimes described as "cellular power plants" because they generate most of the cell's supply of adenosine triphosphate (ATP), used as a source of the chemical energy. Mitochondria are involved in a range of other processes, such as signaling, cellular differentiation, cell death, as well as the control of the cell cycle and cell growth. The mitochondrion consists of the outer membrane, the intermembrane space, the inner membrane, and the cristae and matrix. The mitochondrion has its own independent genome from the host cell. Further, its DNA shows substantial similarity to prokaryotic bacterial genomes, hinting that they may be descended from bacteria which somehow survived endocytosis by a cell, and gave the cell an evolutionary advantage. The inner membrane is highly folded such that its surface area is around five times greater than the surface membrane to improve molecular transport. They are randomly distributed to daughter cells during division of the cytoplasm, however in reproduction only the egg cell contributes mitochondria, and so mitochondrial genes are inherited down the maternal line.